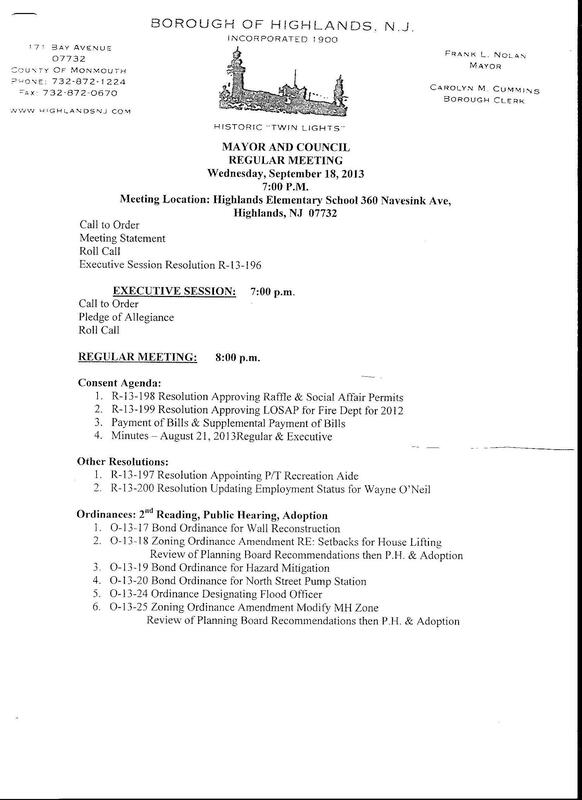 The council meeting is being held at 8pm at the Elementary School on Rt 36.
b) The notifications of public notices… According to one of the previous meetings (July 3rd) The town clerk has to send out notice to the Asbury Park Press & Twin River Times 48 hours prior to the meeting to be “technically” in compliance with the notifications ordinance. The issue is, both papers deadlines, if she sends over something for notification Monday after 3pm the notice will not be included until the Wednesday paper. Basically giving as little notice as possible for public involvement for the same Wednesday’s meeting. c) Shadow Lawn is back up for public comment (O-13-25) and a final vote. So if you don’t want landslides, large buildings or potential litigation costs, show up to voice your concern. If you can’t make it the meeting will be streamed.. (get your popcorn). Maybe the council’s advertisement for a buliding inspector with ‘no experience required’ is a clue? I think someone wants to go out in a blaze of glory …. at any and all costs. collect what he is owed, give back what he has to and flee into the sunset. That’s grounds for a lawsuit. Anyone keeping count on how many issues can be litigated against the current administrators? One thing is for sure, 2 house collapses with three houses destroyed is not a stellar record for sure. And is very disconcerting considering that this is just the beginning of the house raising process. The big question I think someone needs to ask regarding this, is whey in both cases the town rushed to destroy these homes as quickly as possible. In both cases the houses were collapsed within their own lots and didnt not seem to be in danger of falling over or collapsing further. Yet they were destroyed within hours, with the explanation that is was due to public safety reasons. Hmmmmmmmmmmmm???? Be sure to bring refreshments…might I suggest popcorn? This is going to be a very long, very interesting meeting. Im sure it will be most interesting………….. I wonder how many times the answer to questions will have the now familiar answer, ” We cant answer that because of litigation”???? It seems to me that the new way the council answers questions is to not answer them at all, or let the borough attorney dazzle people with lawyer speak. I live in Highlands. I work as an architect. I am a State of New Jersey licensed building inspector. I have offered my services to he township on several occasions. I was told, “Since your office is in Lakewood, you aren’t really a local business so we won’t be using you.” In fact, they removed my business cards from the solutions center. Oh well, I tried to help. Beat them at their game…can you set up a home office?